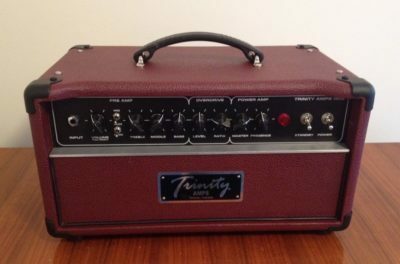 The Trinity Amps The Overdrive Special Design (OSD) was designed using similar principles as Howard Dumble in his ODS amplifiers but with less frills and lower power. His amps were used by used by Stevie Ray Vaughn, Eric Johnson, Carlos Santana, John Mayer, Robben Ford, Larry Carlton etc.. The OSD effectively has two foot-switched channels – Clean and Overdrive. The “spanky” clean preamp has a percussive nature is extremely inspirational. This preamp stays nice and clean and allows you to crank the power amp to achieve a highly percussive tone that taps into the compression and sustain of the power amp tubes. The magic of the OSD comes from the Overdrive channel sound. The Overdrive channel provides a very smooth, sweet sustaining distorted tone. Activating the Overdrive circuit adds two additional gain stages and the result is an Overdrive that ranges from clean and harmonically rich to smooth and thick with ample saturation. The amp uses using 6V6 output tubes in fixed bias mode. Since most on-stage set-ups are miked, 22 watts is both sufficient and surprisingly loud even for medium gigs, especially in this design. This lower wattage helps keep volume levels manageable and makes it very useful in a studio. The preamp uses 3-12AX7 tubes for the Clean channel, Overdrive channel and the Phase Inverter. On the back of the amp there is a control to configure Overdrive Trim. The Overdrive channel and Pre-Amp Boost (PAB) are activated with a footswitch connected to the back of the amp. There is also a passive effects loop. Stephen built me an Overdrive Special Design head and custom Sidewinder Cabinet loaded with 212 Tone Tubby 'Bomb' I had been searching for the holy grail of tone and found it. I cannot say enough about the amp. It really cuts on everything. The clean channel is superb and the amp bristles with clarity and tone. It is a loud 22 watts. I use Les Paul's and the OSD really brings out the great tone. The band really appreciates the Sidewinder cab because the side openings lets my sound project across the stage and everyone can hear me crystal clear. The two channels and preamp controls and balance give the perfect crunch, cleans and downright dirty when necessary. The effects loop works perfectly and the amp runs dead quiet. The amp has one input going straight to the first tube stage. The first tube triode is followed by a passive tone stack with controls for Treble, Middle, Bass and Volume. There are two mini toggle switches on the front panel for Mid Boost and Rock/Jazz and the Volume control can be pulled out for a brighter sound. Volume / Pull Bright – Volume adjusts the signal strength coming out of the tone stack, and going into the second tube stage. Think of this as a gain control primarily for your clean channel, but it will impact the Overdrive mode as well. The Bright switch is a push-pull located on the Volume control. Mid – toggle switch increases the value of the treble capacitor in the tone stack to boost the midrange frequencies. Rock/Jazz – toggle switches between a Fender-esque voicing (Rock) and a more hi-fi-type of voicing (Jazz) with less bass and gain. Rock has a fatter midrange and a deeper, spongier bottom end. Jazz tightens up the bottom end and adjusts the contour of the midrange, giving the amplifier more of a hi-fi response. The Treble, Mid, Bass tone stack is followed by another triode stage. The resulting signal is either fed straight into the power amplifier (Clean channel) or into the Overdrive channel circuitry. The output section uses a standard long tail pair phase inverter utilizing negative feedback. The phase inverter section of the amp also features a Presence control. This will add sparkle and clarity to your tone. Prior to the phase inverter there is a Master Volume control which is very effective at setting the overall volume of the amp. The ODS is somewhat unique in that it uses a lot of filtering in the power supply. The large filter capacitors help keep the tone tight and focused because you don’t want loose sounding bass especially in Overdrive mode! For the Overdrive channel to attain its very smooth, sweet sustaining distorted tone, it is carefully tuned in terms of gain and frequency response. The Overdrive channel and Pre-Amp Boost (PAB) are activated with a two-button footswitch. Both the channel switching and PAB switching is done by two relays inside the amp. The PAB accentuates midrange frequencies and attenuates low frequencies, making it great for cutting through during a solo. Engaged, you will also notice an increase in gain and distortion characteristics. This is useful for pushing the power section, lead boost and getting a bit of extra dirt from the amp. The Overdrive channel is two cascaded triodes being fed from the clean channel signal. Gain is attenuated before and after each of the two triode stages in the Overdrive channel. This limiting of gain keeps the amp smooth and prevents over the top harsh distortion tones. The Overdrive channel features two front panel controls – Ratio and Level. Ratio serves a sort of volume control for the overdrive channel. Level adjusts the amount of gain, and in turn distortion in the overdrive mode. On the back of the amp there is a Trim control that controls the amount of signal sent into the first stage of the Overdrive circuit. Lower settings is more touch-sensitive, lower gain sounds. Higher settings are more compressed, higher gain, and harmonically complex. The OSD layout is well thought out. Due to its compact size, a heavy-duty printed circuit board is used which holds only the resistors, capacitors and relays. This hybrid design provides a compact and noise free design with excellent reliability. Parts selection, lead dress, voltages, tube selection and speaker selection are critical in getting a reliable and good sounding amp. A day after playing the OSD I must say how good it is. It is super true to it’s design and delivers a high bandwidth (lots of lows and LOTS of highs) and high fidelity sound where notes just jump out and sustain for longer than normal. I could get my Two Rock to do some of the things the Trinity OSD did but the clean channel and tone stack of the TOSD are quite different from that of the Opal. The cleans are from jazz pure through SRV jangle to downright over driven. There is a lot of gain on tap in the clean channel. This is a good thing for me as it will happily adjust input levels for a wide range of pickup outputs and guitars. I like my cleans on the edge of breakup so no problem there with the 335, Les Paul and PRS. I typically had it set for just above 9:00 o’clock. The Strat required a little bit more of the volume knob to make to get to that level..say 12:00 o’clock or a little less. In the Opal the clean channel doesn’t distort until both gain and volume are nearly cranked… and it’s not quite as jangly for some reason. And the TOSD had this singular ability to allow feedback with additional harmonics to come through easily. This was true even in the clean channel while playing clean. Notes just rang on for much longer than with other amps especially at house volumes. The Opal did not do this at that volume. Bottom Line is, if you can’t get a good clean sound out of this amp you may need a different guitar. The overdrive channel of this amp is truly special. Along side the clean channel it makes the amp quite flexible before you even get to the loop or pedals etc… Searing pure overdrive. Smooth super hot Marshall with an upper class education (Cambridge). The Trim control was key to getting in your sweet spot for OD tone. The key for me was to get good pop and frequency response. The gain will come later but for me the Trim control was like a “How do I want the amp to respond to the way I pick” control. The Level control was set to the amount of overdrive I was looking for and Ration was usually set to balance the volume levels with the clean channel. I liked this channel with mid-boost on. Oh, and once you engage PAB you’re in for a treat. This is the pure unfettered highly overdriven tone that connects you directly with the air resting on the cone of whatever speaker you choose. Like a car going around a corner real fast, everything makes a difference. How hard a note is picked, where a note is picked, glissando into a not (up or down) and pick angle of attack all change the way a sound comes out of the amp. Volume and tone settings on the guitar are critically important as these amps can be set to go from pretty clean to nasty from changes in the guitar’s volume control. The Opal is very good at this too but not THAT good. The overdrive channel with PAB and mid-boost on is capable of infinite sustain. There is one clip where I hit a major third bass note in a D major chord and it started to sound like a Hammond organ once all the overtones came in. The 335 and PRS where particularly good at producing this effect. Overdrive channel, bridge pickup, volume on 3 and picking lightly will provide a clean tone with significant sustain. The clips with echo and/or reverb where done with a C-Lator in the loop with a TC-2290 providing echo and a Holy Grail providing a surprisingly good reverb. With that setup the amp took on a little bit of additional character as you now have 2 or 3 more gain stages to tune providing no impediment to the harmonics and joy and love etc.. The Opal sounds a lot better with something in the loop. The TOSD already sounds super with or without the loop but, as a fender guy, I do love a little reverb and the grail works well. I’m sure this amp will work for some players and not for others but I was happy with the flexibility. Once you get to know it, the amp is able to deliver some very convincing aggressive rock tones or lead and rhythm playing, Jazz tones, funk and blues tones all without much compromise if any. Hi There: I just wanted to tell you about my band’s very positive experience with your OSD amp. I’d heard great things of you in the past, but all from mainly blues, country, and straight up rock players. While I can play that stuff and can sometimes tend to many BB-isms and much Stevie Ray-ing when I’m just rehearsing on my own, my meat and potatoes is very much of the Black Flag downpicking and an incredibly overdriven Mesa Boogie variety. Anyways, we’ve been holed up in Toronto at B-Musique studios, recording our new album. Bryant, the owner of the studio, has a beautiful blue suede covered OSD that I plugged into for what I was thinking were scratch guitar tracks. I was entirely wrong. I used it for everything. Then my rhythm guitar player’s Engl died, and I sent him right into the booth with the OSD. I don’t think I’ve ever played a more musical, harmonically rich amp. It literally saved the day for us, and I’m pretty sure we’re both sold on getting one. Now we just need to find a black market organ dealer so I can finance it. Hahaha. Great job. Love the tone. In 2017 Stephen built me the Trinity OSD Overdrive Special Design head and the custom Sidewinder Cabinet loaded with 2 x 12 in. Tone Tubby’s; a red Alnico and green 12. I had been searching for the holy grail of tone and found it. I cannot say enough about the amp, it really cuts on everything. The clean channel is superb and the amp bristles with clarity and tone. It is a loud 22 watts. I also use the OSD in combination with a Marshall JCM 800 2 x 12 cab and also my JCM 800 4 x 12 cab, and they all sound good. I use Les Paul’s and the OSD amp really brings out the great tone. The band really appreciates the Sidewinder cab because of the special openings on the side that lets my sound project across the stage and everyone can hear me crystal clear. The two channels and preamp controls and balance give the perfect crunch, cleans and downright dirty when necessary. The effects loop works perfectly and the amp runs dead quiet. All round great amp Thanks Stephen! Weight: Head: 20 lbs., 112 Combo 50 lbs.